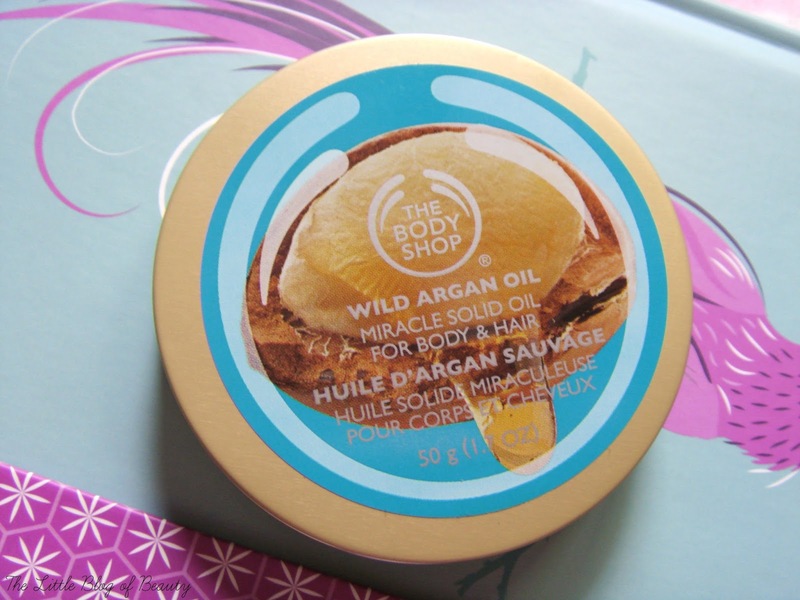 When I first saw the Wild Argan oil range there was a couple of products I knew I definitely wanted to try, namely the Radiant oil and the Miracle solid oil. In store I discovered you can't actually use any discounts on the range at the moment and I didn't really want to spend £14 on the Radiant oil (this is the most expensive product in the range) so I just picked up the solid oil, which is much cheaper at £8. In the winter I get patches of very dry skin and although I do like dry body oils I'm not keen on how messy they can be to apply, with the bottle getting all oily while you handle it. So I wanted to try out a solid oil to see if this is a little less messy to apply. The Miracle solid oil comes in a compact slim tin that contains 50g of product. Although the lid does spin round it is securely held in place and I don't think there's any risk of this popping off if you want to keep it in your bag. Inside you'll find a caramel coloured solid (hence the name!) block of oil. At first I wasn't sure about the Argan oil fragrance but it is starting to grow on me now. Although for me with this product I'm more concerned about how moisturising it is than the fragrance. I was a little disappointed to see that argan oil is the 9th ingredient out of 14, but coconut oil is the top ingredient and it also contains vegetable oil, beeswax and shea butter, all of which are in there in larger quantities than the argan oil. So far I've only really been using this as a cuticle oil to keep the skin around my nails soft and moisturised and it works really well. I do love Essie's Apricot oil, but as a tradition liquid oil this can get a little messy to use, especially when I will insist on carrying on typing while I'm letting it sink in. For my cuticles I just rub my thumb on the surface of the oil in small circles for a couple of seconds to melt the oil down a little and then spend a couple of minutes on each nail massaging it in. It's actually very relaxing to do and you can do it while watching TV in the evening. As well as a cuticle oil this can also be used on elbows, heels or anywhere you may suffer from dry patches and can even be used on your hair. It's the perfect multitasking product that's quick and simple to use and can easily be carried around with you. The Miracle solid oil is £8 and is available from The Body Shop. 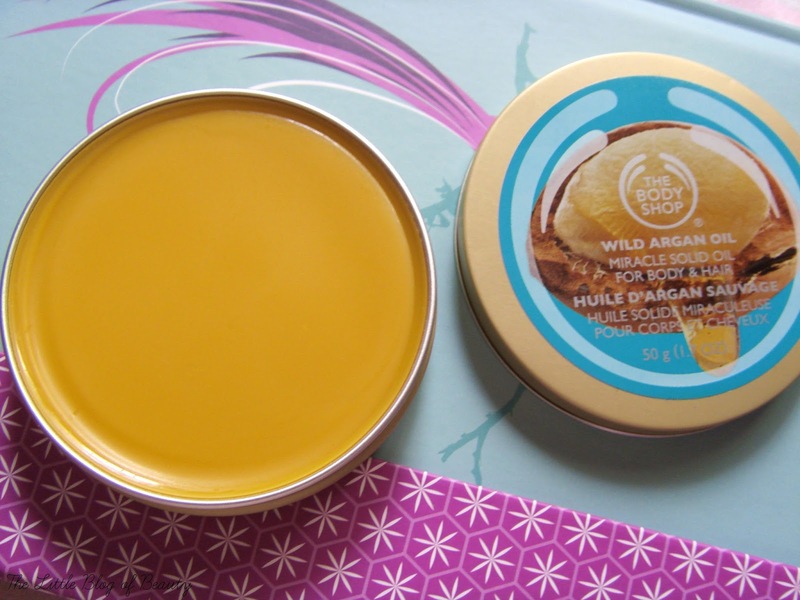 Have you tried anything for the new Wild Argan oil range? I haven't tried anything from the range yet but I was actually going to use some discount codes to nab some money off. Such a shame you can't use discounts yet but that gives me time to check out reviews :) this sounds intriguing! I would hate to ruin it though, and stick my mitts in! This sounds lovely must check it out! This sounds like it's got a load of great ingredients in it. Perfect for this time of year! I still need to have a look at the bits from this range but I'll definitely be heading to this first!